Fourteen IP looks forward to welcoming the Residence Inn Aberdeen to Evolution Voice, its cloud based telephony service for hotels. Marriott International is opening its second Residence Inn hotel in Scotland at the Marischal Square development in Aberdeen. The four-star Residence is due to open in the summer and is aimed at extended stay business and leisure customers. 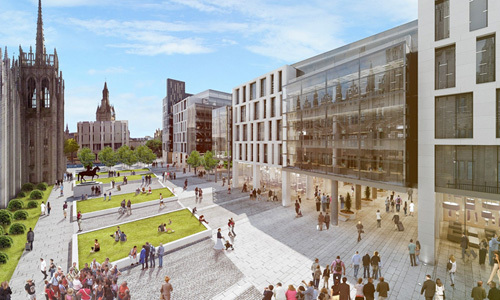 The Residence Inn Aberdeen will be opened in the summer as part of the city’s multimillion pound Marischal Square project, which will see a number of new restaurants and cafes opening in the city, as well as office space. It will have 126 rooms comprised of 114 studios and 12 one bedroom suites, each with a fully equipped kitchen and separate areas for living and sleeping, a format that is very popular in the United States. The hotel will have a number of public areas including a fitness centre, a business centre, a lounge bar and grab-and-go shopping area. The hotel is the second Residence Inn to be opened by Marriott in Scotland, the first being in Edinburgh but there are over 700 Residence Inn locations around the world, several of which have already adopted the Fourteen IP above property telephony solution.